Recommended Citation: Conn, S S, P Macedo, and J Meese. 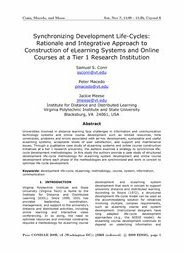 Synchronizing Development Life-Cycles: Rationale and Integrative Approach to Construction of eLearning Systems and Online Courses at a Tier 1 Research Institution. In The Proceedings of the Conference on Information Systems Applied Research 2009, v 2 (Washington DC): §3363. ISSN: 0000-0000. Universities involved in distance learning face challenges in information and communication technology systems and online course development such as limited resources, time constraints, problems and errors associated with ad-hoc development, sustainable and useful eLearning systems, acceptable levels of user satisfaction, and support and maintenance issues. Through a qualitative case study of eLearning systems and online course construction initiatives at a tier 1 research university, the authors examine a strategy to synchronize life-cycle development methodologies. In this study the authors provide a case study of structured development life-cycle methodology for eLearning system development and online course development where each phase of the methodologies are synchronized and work in concert to optimize life-cycle development.